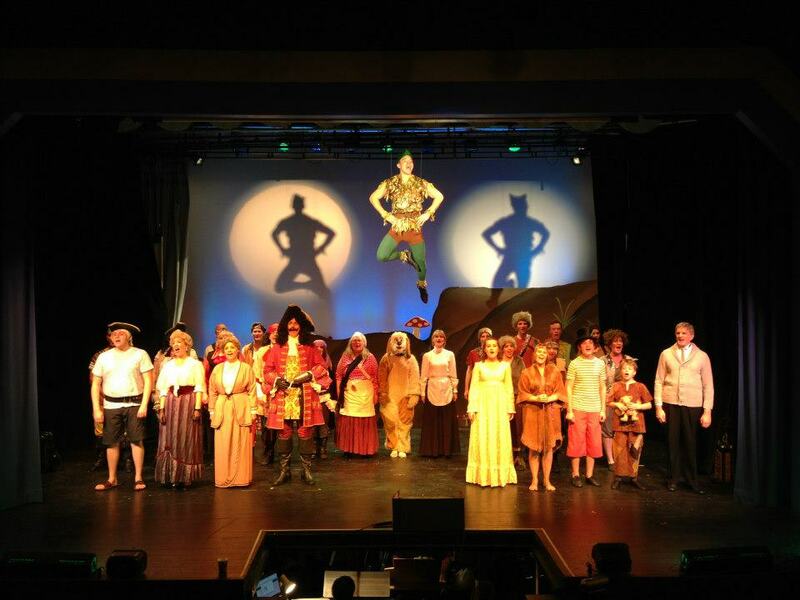 I was lucky enough to direct Bromley Players production of Stiles & Drewe’s Peter Pan. This is a musical version of the famous story of Peter Pan, which I’m sure needs no introduction. It is the Stiles and Drewe version which are the duo that brought you Mary Poppins; Betty Blue Eyes & Honk. The show has a large amount of musical numbers all with very different sounds, which is one of the reasons I loved the show. This is a perfect show is you are a society looking to perform a show for a large cast and lots for the ensemble to do. The ensemble take the parts of Londoners, Lost Boys and Pirates. In our production we split the ensemble in 2 – the majority of the dancers were put as Lost Boys and the ‘movers’ and older males were Pirates. Although it is written that the Pirates are all men we found that the female ensemble slotted easily into some of the pirate roles. You also have the opportunity to have children in the cast. We double cast the role of Michael with 2 10 year old boys, had a 13 year old playing the role of John and then also had a few older teenage boys within the Lost Boys Gang. It may be important to note that this meant we had to have a chaperone however we could not get around this due to the ages of the roles of Michael & John. If we had decided to add any younger girls (under 16) to the Lost Boys gang we would have needed an extra chaperone so for this reason we kept it to boys only. There is a large amount of supporting roles within this show -apart from the usual suspects like Peter Pan, Wendy and Hook you have Mrs Darling who has a lovely number near the opening of the show, the Storyteller who opens the show and narrates throughout, Smee who has a comedy number, Tiger Lilly which can be made into a strong dance role as well as many named Lost Boys and Pirates. There is no strict set requirements for this show however the audience do come expecting. There is a variety of settings ranging from the streets of London, the Nursery, flying over London, Neverland, The Pirates Ship & Marooners Rock. Ideally you do need a clever set designer to design the set for this production. We built our own set for this production and it cost just over £1000. There is a variety of costumes required for this production. The show opens on the streets of London so some period costumes are required. However once you hit Neverland some imagination can be used to costume the lost boys and pirates which didn’t work out too pricey. You also need items such as mermaids costumes, a dog outfit and a convincing hook!! This is where the show gets interesting. People come to the show expecting flying and whilst it’s not a necessity you do have to think of an ingenious way round it if not flying. We decided to go for it with the flying. It is expensive to do and cost us around £1200 to have 2 people flying both up and down and across the stage and another 2 simply up and down. A whole evening was required to rehearse the flying and during the flying sequence you need 2 people per person flying. Reflecting back on the flying it was difficult to pull off in a theatre with limited wing space and this is something you may wish to consider before committing to the show. For this show you need a director not afraid of a challenge – this show throws at you flying, working with children , numerous settings and sword fights. Not one for the faint hearted. The musical director again needs to be confident working with a large number of people. The choreographer also needs to be able to draw on a number of styles ranging from the Pirates movement, to Tiger Lilly and the Indians dance to the lost boys energetic number. One of the attractions of this show was the pull it would have for potential audience members. 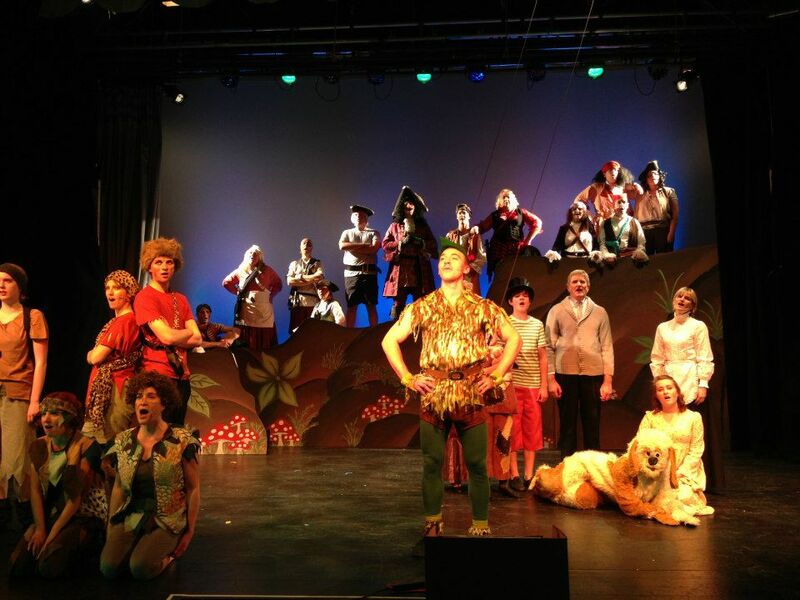 It is a great show to attract families to and our matinee sold out very quickly. The show sold in excess of 90%. This is a great production for a large company who have numerous talented members. It is a challenge and not a cheap show to put on however due to the shows name this is counter balanced by the number of tickets you could potentially sell. We offered a free programme signing by some of the cast for children after the matinee -this helped the matinee sell out even faster and ensured that photos were put on social media -helping publicize our show for free. For more information, musical extracts and photos check out Stiles & Drewe’s page on this show. Also by Stiles & Drew is Betty Blue Eyes, Mary Poppins, Honk!, Just So and Soho Cinders.